The Navy�s mine research and development programs are focusing on the need to improve the effectiveness of US naval mines in joint expeditionary warfare scenarios. In future years, exploratory development will pursue development of multi-influence sensors, data fusion of multiple influences, advanced sensors for bottom and moored mine applications, and mid-water depth mine concept evaluation. Engineering development efforts include advanced mine algorithms for ship detection, classification, and localization, and for increased counter-MCM resistance; generation of operational data in support of minefield planning efforts; and concept evaluation and operational requirements generation for the next-generation Submarine-Launched Mobile Mine (SLMM). The 1950's technology in MK67 SLMM is approaching obsolescence. An Improved SLMM program has been proposed to replace the Mk 67 by converting Mk 48 torpedoes into dual warhead mobile mines. Modification of the Mk 48 torpedo, using the existing propulsion and wire guidance systems and fitting the torpedo with two mine warheads and Target Detection Device Mk 71, could satisfy the SLMM requirement. Engineering development also continues to improve mine subsystems and power sources for mines. Lithium batteries represent a significant improvement over other electrochemical systems and are environmentally safe for disposal. Programs are underway to qualify and incorporate lithium batteries into mine warfare systems. Programs are in research and development. Procurement dates have not been established, and the developer/manufacturer is to be determined. 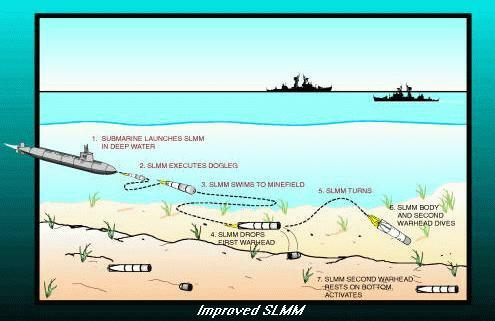 The Improved SLMM will be developed as a joint program using the mine design expertise of the Coastal Systems Station along with the propulsion expertise of the Naval Underwater Warfare Center, Divisions Newport and Keyport.